Happy 4th of July. God bless America! Also, happy birthday to my Sweet Pea (who does not want me to call him that anymore) grandson who turns eight today. I cannot believe it. For years my husband and I held the "Annual Crutcher 4th of July Picnic" at our home back in Illinois. Since we've moved to AZ, however, we've tried to keep up the tradition, but there aren't that many family members here who could attend. I believe the last 4th of July barbecue we had with some good, grilled burgers and all the accompaniments was the 4th of July 2002. That is the day upon which my daughter went into labor while eating her "celebration burger." As quickly as we could, we rushed her to the hospital that afternoon and she gave birth that evening to our grandson Kai. What a happy 4th of July. Okay, enough of the sentiment stuff. Now on to the food stuff. Kai's birthday party is today, and my daughter is having a, yeah, you guessed it, barbecue. 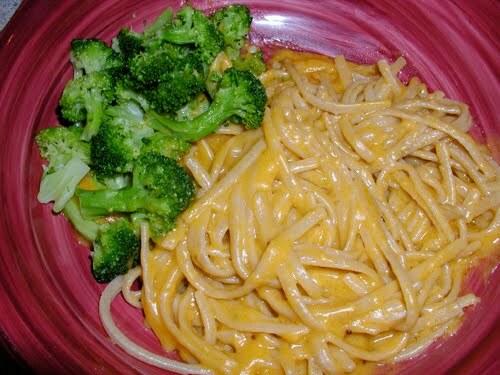 So, since I will not be eating anything but the fruit she will serve as a side dish, I decided to whip up some of my special vegan cheddar cheese sauce and put it on some linguini and added some broccoli as well. 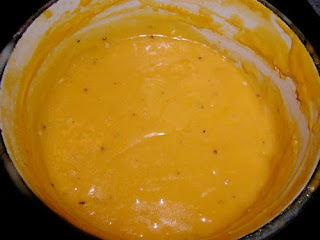 This sauce is the same one I prepare for my Macaroni & Cheese, of which I am still in the process of perfecting just the right amount of ingredients. Nevertheless, this is so delicious and one would not even be able to tell it has no real dairy products in it. I ate my lunch, pictures attached, and now need to wrap the present and get over to the party! Watch for future postings of the actual recipe. This is so much fun. What are you using to make your Cheese like substance. just curious. I ate a strict vegan diet for 9 months and could never figure out how to do that. I make a white roux with some olive oil, Earth Balance (Soy Free) butter, and flour. Then I add "So Delicious" Coconut Milk (plain, unsweetened) to make it liquid and to the consistency I want. I might add a bit of water, or sometimes some soy milk also. The coconut milk makes it really white and rich--delicious! Then add some salt and white pepper or any other seasonings you like.